You can read my initial reaction to the new service in this Coin Update article. In my initial article I questioned claims of increased precision and consistency in grading, primarily because PCGS’s promotion didn’t fully take into account reconsideration of a coin sent in previously to finally get the grade right. 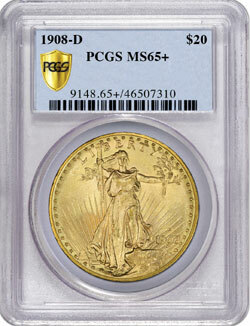 Perhaps 99% of the time, PCGS gets the grade right. About 1% of the time, say, it comes close or makes a mistake. Why not acknowledge human error? The best promo for the new service would have been that acknowledgment rather than harping on coin doctors cracking open and resubmitting coins. Actually, I’d feel more secure if Hall announced that the technology can program a digital master set of coins for each type, mint mark, denomination, strike, luster and more and not only test whether the machine can detect the same coin as a resubmission, but also whether it can detect a PCGS grader who consistently gets it right or wrong. I’d feel more secure if PCGS awarded the plus sign for any submission without requiring a special price list for certain types of high-end turn-around services, the same way that its rival Numismatic Guaranty Corporation does with its star designation on routine submissions. If it’s about eye appeal, let’s not make it about price, too. I’d feel more secure if all this had to do with coins rather than business and Registry set competitions. Case in point: Immediately after PCGS’s proclamation, NGC announced it will do the same with “plus” grades in about 60 days, according to this release. I’d feel more secure if PCGS’s new revolutionary holder was used for all submissions, not just the pricey ones. I’d feel more secure if humans rather than computers were calling the shots in numismatics. PCGS made a big splash with its new 700-point system to designate a coin to the decimal point–a gimmick in my mind to get Registry set participants to reholder their best coins with a 15% shot at a plus designation. Indeed, a 700-point system may be a nifty internal way to grade more precisely, especially since the company is using a digital program–and we all know how much fun that can be, with the way computers think; but the last thing we need in numismatics is more complexity. Soon we’ll be seeing coins designated PCGS Secure Plus + 1878-CC MS66.6 VAM24 (revised) II6 – B1f (Doubled Cotton Leaves)(179) I-4 R-4 Obverse II6. Oh yes, I forgot: the CAC sticker. So let’s type the label in agate fine print: PCGS Secure Plus + 1878-CC MS66.6 VAM24 (revised) II6 – B1f (Doubled Cotton Leaves)(179) I-4 R-4 Obverse II6 CAC. In my opinion, all of this tracks back to John Albanese whom I admire as one of our leading experts but whom I also question for founding Certified Acceptance Corporation. Albanese also was one of the founders of PCGS in 1986. Then he left that company and founded NGC. Could it be, through no fault of his own, that he inadvertently founded a pandemic of designations that may harm the very industry he helped develop? Here’s what I am imagining: A numismatic world overrun by computers to store megabytes of data and pixels about each coin, with the complexity causing youth collectors to lose interest in the hobby because they cannot fathom all those data. I imagine a digital world that one day will decide plastic cards have made coins obsolete, the way that e-mail is doing now with stamp collecting. What we need is a coin world with more simplicity, honesty and affordability. If we get it, I’ll feel secure. I appreciate Mr. Bugeja’s thoughtful comments on PCGS Secure Plus. However, I believe that his technological determinism may have led him to place too much emphasis on the use of computers at PCGS. I share many of his concerns and would add that I do not consider PCGS, NGC, or any other grading company to be anywhere near 99% accurate. I own PCGS MS-63’s that are substantially nicer than PCGS MS-64’s of the same coin. I have lots of NGC MS-65’s that are much nicer than some of my PCGS MS-65’s, etc. There is no question that graders are fallible. I would add that everyone seems to chase PCGS and NGC coins, but I have purchased some ANACS coins that are gorgeous and very conservatively graded. I am still digesting all the new developments at PCGS and NGC, but I do not believe that the new computer matching service will mean the chances of getting an upgrade on a re-submission are as slim as Mr. Bugeja states. Besides, that would obviously hurt PCGS’ bottom line a great deal, as he mentioned. As I see it, the digital fingerprint and computer matching are designed primarily to add in identifying doctored coins, coins that are not genuine, and coins that have been resubmitted repeatedly. In addition, I know a lot of collectors are still sceptical of the CAC green sticker service and see it as another gimmick to make money. But I can tell you from my own recent experience, that the CAC-stickered coins I have purchased are of superior quality and that they are likely to have better resale value than coins without the designation (not including coins with the new plus designation, which will also bring higher prices). And I was fortunate that I did not pay a premium for the green sticker. Of course, only time will tell how it all plays out. I’m sure the grading companies will make adjustments and changes as warranted. That’s how this humanist sees it. Thank you for providing another valuable perspective. I appreciate your comments because there are many ways to view this digital phenomenon. I don’t like this at all. When does it stop? Is there a Secure plus plus waiting in the wings or even a plus plus plus? I’m a firm believer in buying the coin and not the label. I do utilize TPG’s when it comes to buying coins w/o the chance of having them in hand prior to buying. The mint is reaching new levels of perfection on their collectors coins. I fully expect a new coin fresh from the mint to be at a minimum grade 69. If we add the new secure plus grading to it it’s going to really frustrate some buyers. Let’s see, the perfect coin graded 70 isn’t perfect anymore because there’s a 70+ now and if a business strike is proof like then do we get a grade of MS70+PL? Sigh…. I see frustration in many a collectors future including my own. I’m not sure how eloquent I was here but hopefully I got my message across. You’re right, Ron, and as much as I value a few of these companies–especially PCGS–I think the competition and the money to be made in Registry sets (a different kind of competition) have led to all manner of designations on labels purported to pinpoint grading as well as authenticate coins. Of course I realize the good aspects of Secure Plus, particularly when it comes to doctoring and counterfeiting coins; but what my articles argue for is a system that takes into account the hobbyist more than the investor, competitor and dealer. In that regard, the article above advises a more uniform, affordable and simpler way to holder coins so that we purchase the coin rather than the holder. I would appreciate knowing if other people feel that the prospects for getting a full point upgrade will be much slimmer in the new “Secure-Plus” regime. Barry Stuppler has advised his clients to wait a while to re-submit coins since he expects graders to be more relectant to upgrade coins. What I have in mind is not people who endlessly re-submit in hopes of eventually getting an upgrade. I’m thinking of really nice coins in Old Green Holders or coins that are obviously undergraded that were submitted by someone else. Mike Bugeja, for example, apparently thinks that once the new computer system finds a match, graders are likely to make no changes in most cases. But, why would they not re-evaluate the coin after a match? Isn’t that what we are paying for? I need to address a comment by Louis: I don’t “apparently” think that the graders are likely to make no changes; my observation is based on the few seconds out of endless minutes of video and the scant reference to, oh-yes-and-we-may-reconsider-the-grade comment that comes at 7:10 of the 8:10 part III video segment, with this one-line acknowledgment: “Matched coins (sic) grade will probably not change but there is a chance for reconsideration.” That comment is telling, from a promotional perspective. I’m not necessarily against Secure Plus; I am, however, against how they promoted it without acknowledging that the new computer system could stabilize grades. To me, that’s its chief value; but then the company has to admit that occasionally it gets the grade wrong. That’s not exactly a trade secret. Finally, we won’t know how this program is going to operate until we learn the internal grading protocol in more detail. For instance, what is the process for a grader to override the computer? I’m an authority on how computers override humans. See: http://www.interpersonal-divide.org. If I could counsel PCGS, along with the publications and blogs touting the new service, I would caution that world-class graders have to use the digital scanning system in a manner that they have either yet to discern or publicize–as a method to achieve consensus on grading, regardless of plus designations, so that re-submissions don’t have to be made because the graders erred.